Looking for skip hire Canning Town E16? 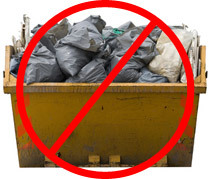 If you’re undertaking a building project or just having a good clear out you might think that skip hire Canning Town is your best option. But have you thought about all the hassle involved with permit issues, problems with space, access and grief from your neighbours? Not to mention the cost! To discuss your options for skip hire Canning Town E16 or Royal Docks and get a competitive quote please contact us at 0208 504 7390 or 07957 123 019 for further details. Alternatively, you can reach out to us online for a quick and easy no obligation quote.